Melfann's domain: Durian Party 2014! This was 1 month in the planning. We wanted to go to the durian buffet organised by I Eat, I shoot, I Post but alas, the tickets were all sold out. 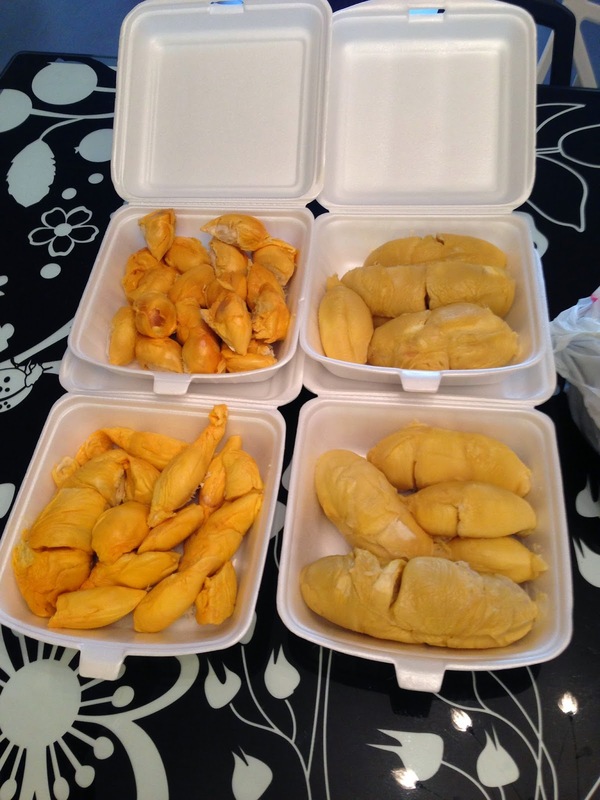 Thus, we took things into our own hands and organised our own little durian party. Those on the left is called 'Red Prawn' durians due to the shape and the deep colour. It was a bit dry and very very rich. Some pieces tasted like coconut cream! On the right were my orders from my regular durian seller. They were a mix of the D24 and Cat Mountain King variety. So, the taste of the flesh is a little more alcoholic or some would say, 'bitter'. What you're looking at my dears, is $58 worth of tropical fruits. Yummmehhh!!! 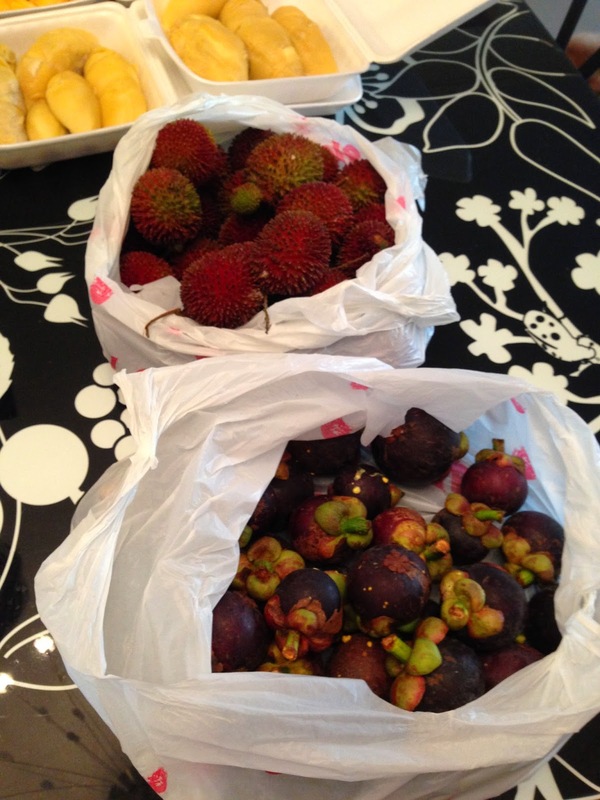 Durian season also means that the queen of fruits, Mangosteen, would make its appearance and boy were these sweet! The Chinese believe in 'heaty' and 'cooling' fruits so Durians are supposedly heaty while mangosteens are cooling. Thus, eating them together will balance things out. See...there's a yin and yang to eating too! I love living in the tropics. I can easily get my hands on these lovely fruits relatively cheaply and easily! Only thing marring the whole experience was the ants that accompanied them. There were different types of ants hiding under the 'leaves' of the mangosteen and in between the rambutans. We were not sure what sort of rambutans these were either. The 'hair' on them aren't very long and the outside of the fruit reminded me of those self-massage balls or those stress balls. Tasted like the usual rambutans but was a little tougher than usual. Hybrid fruit? Goodness knows. Anyway, we bemoaned the fact that we were all getting old. 4 of us with 4 durians but we couldn't finish it all. Bah. Haha...nonetheless, it was a good time just hanging out with friends and my 2 godchildren. Never thought I'd spend an evening watching cartoons that taught the alphabet or played with toy cars and trains but yup...that was my evening!